Ford Mustang quickly became one of the most popular sports car, sold in the United States and many automotive markets around the world, which has led many people to ask us if there are any differences between the cars here in America and other countries around the world – so that today we bring you ten ways to convince that the European Mustang differs from the Mustang sold here in the US. 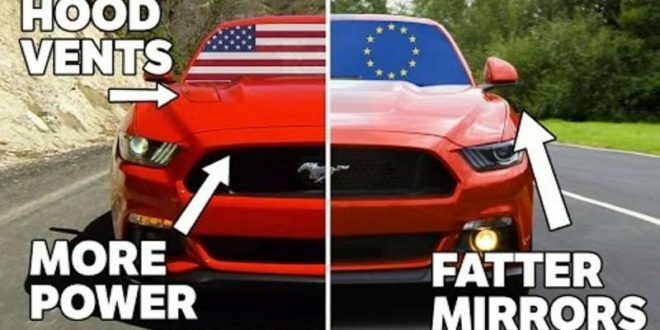 Most of the difference between American and European Mustang Mustang are located on the outside, because of different safety regulations in countries outside the United States. The Mustang GT in the US has hood vents,while the European Mustang GT does not. Mustang in the United States has a red tail light lenses and a solid clear security light, European Mustang has a clear tail light lenses with red bulbs and additional red insert in the backup light. Mustang in the United States has a flat mirrors that extend beyond the car, European Mustang has a shorter, taller mirrors with more than triangular shape. 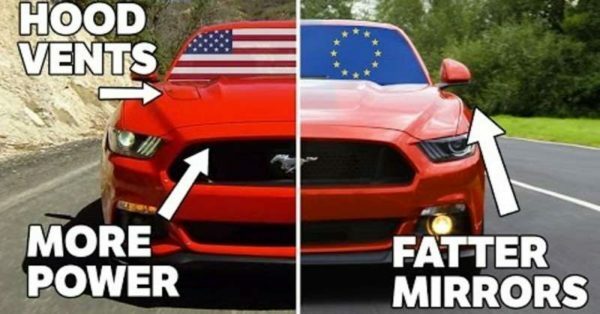 Mustang in the US has red rear side parking lights, European Mustang has Amber lights in the same place.